Need a Small Order? We can make it happen! 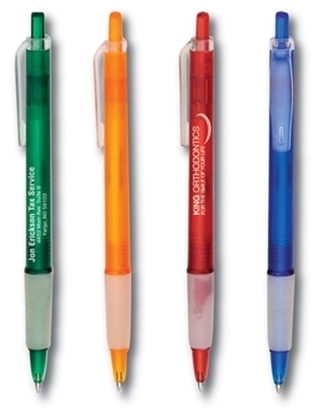 If you want to get a great deal on a cost effective promotional pen the CEDAR is a clear choice! Available in many colors! 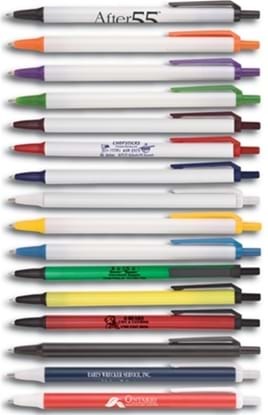 This pen is priced at a stick pen price and is by far our best selling at this price point! These stick pens are made with pride in the USA. Priced to compete with other imports yet quality that is unmatched by their less competitors made in foreign lands. 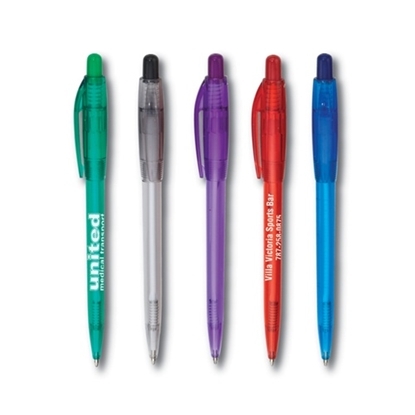 Available in dozens of colors and combinations also with blue ink refills. All combinations not pictured. Solid constructed stick pen with a supported covered nib (part of the pen that comes in contact with the writing surface). Dont let the simple lines of the RASCAL fool you, it is packed with the best writing ink on the market. Our DG5 ink is the latest ink technology in pens. You can actually feel the difference as your pen slides across the paper effortlessly. White barrels with 4 trim colors and the most comfortable grip around will have you reaching for your RASCAL. Priced to compete with other imports, yet quality that is unmatched by their competitors, made in foreign lands. For custom ink refill colors, please call. 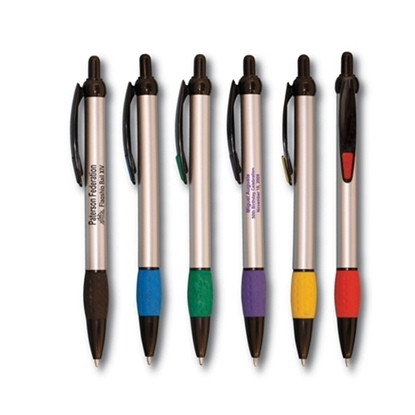 This is a retractable, click pen with a curvaceous, contoured body. This Gripped Slimster has a white barrel and bold colored grips and accents. The hour glass body is eye catching. 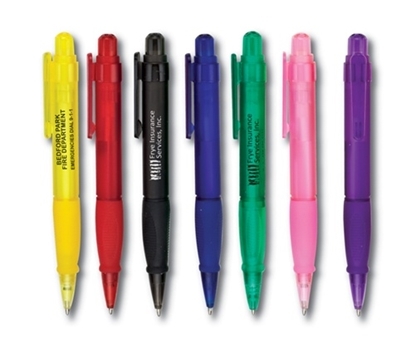 This pen has become an industry leader and is now available in more color options! You can't go wrong with this style. 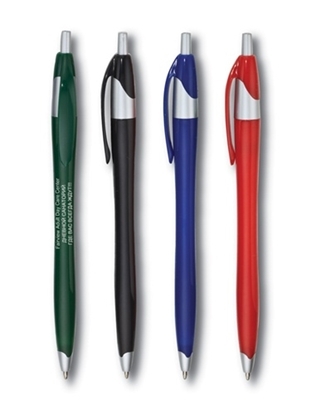 This is a retractable, click pen with a curvaceous, contoured body. This Gripped Slimster has bold colored barrels and black accents. The hour glass body is eye catching. 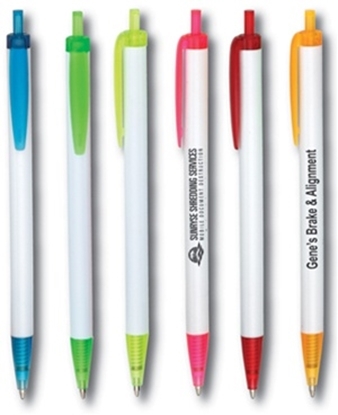 This pen has become an industry leader and is now available in more color options! You can't go wrong with this style. Being the most popular pen in the USA is not an easy feat. This style represents quality, color and price. Yes, this pen is the most popular pen in the country in its class. This retractable pen is slim and simple. Silver trim accents at tip , clip and clicker. This retractable pen is slim and simple. It's offered in orange and yellow. Black accents at trim, clip and clicker. 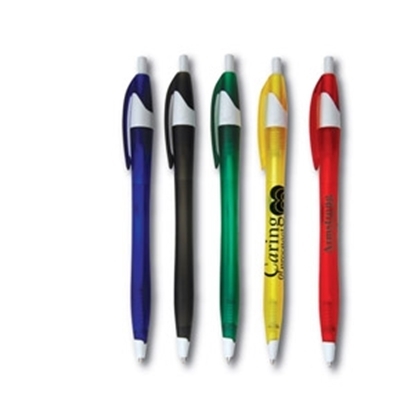 This retractable pen has a curvaceous contoured body. 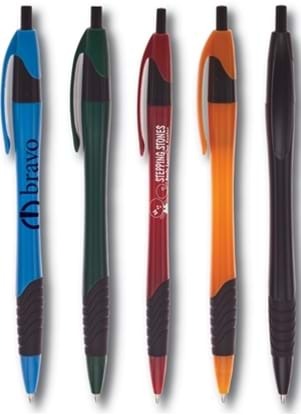 It has become one of the most popular pens in the advertising industry. Very impressive with it's hourglass shaped barrel. You can't go wrong with this style. For the high quality, durability and low price, you simply won't find a better deal. 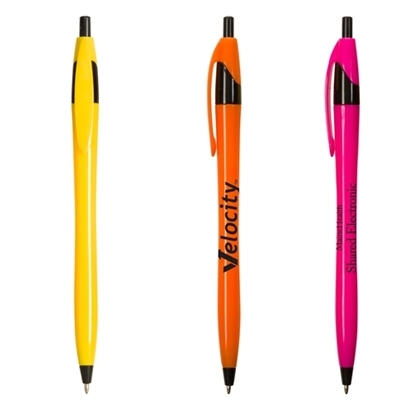 This retractable pen, with its curvaceous contoured body, has become one of the most popular pens in the advertising industry. Very impressive with its hourglass shaped and translucent colored barrel, you can't go wrong with this style. For the high quality and durability, low low price you simply won't find a better deal. 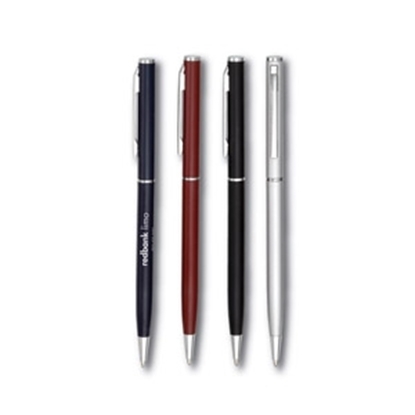 The Slim Twist is a twist pen with a sophisticated look. 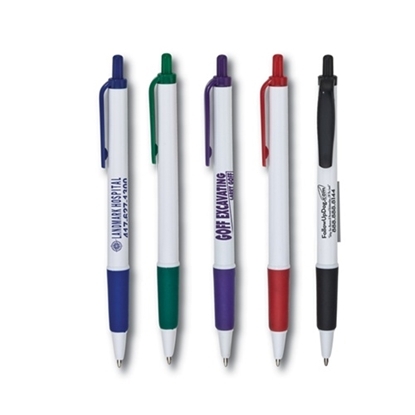 Deep colors and silver accents make sure your message is noticed, with this favorite pen. 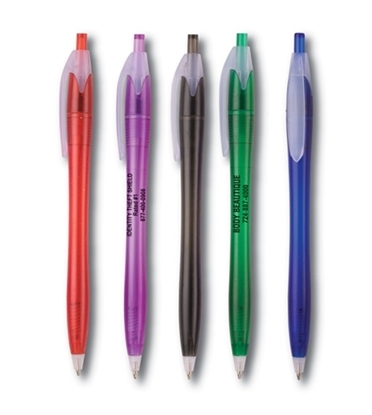 The Value Pens are a very sharp pen that have a black grip. This is just an amazing deal. 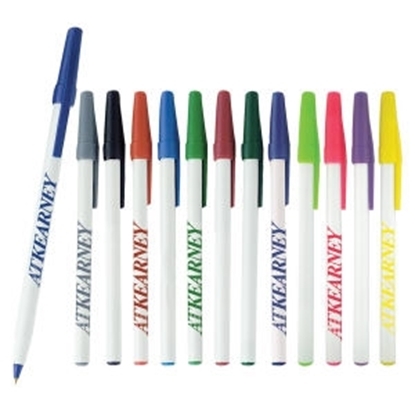 Also a very popular click pen, this style serves your advertising message in a clean and simple way especially with its translucent colored clips and trims. This classic twist action pen with chrome accents has been around for decades. Rich look and feel with newer lower prices. 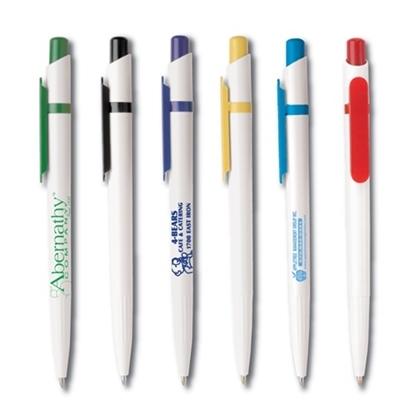 The Dealer Pen is slender, sleek, quality promotional pen. Click pen with a classic look. 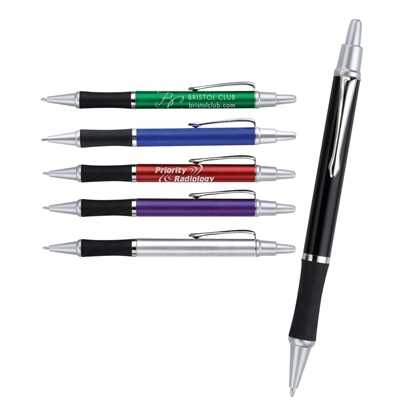 This retractable pen, with its curvaceous contoured body, has become one of the most popular pens in the advertising industry. Very impressive with its hourglass shaped barrel and rubber grip, you can't go wrong with this style. For the high quality and durability, low low price you simply won't find a better deal. A turn of the century popular style, this click pen with its golf balled polka dotted rubber grip, offers a great advertising message. 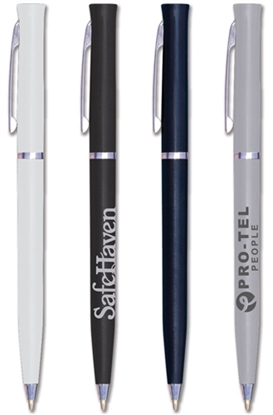 Print the silver barrel in black in or match the colors of the grip and accent on the clip with the imprint. Solid colored barrel with a glossy varnish. Chrome colored clip and trim with a comfortable rubber grip. This pen replaces the metal look-a-like for an unbeatable price. We strongly recommend the silver imprint color. 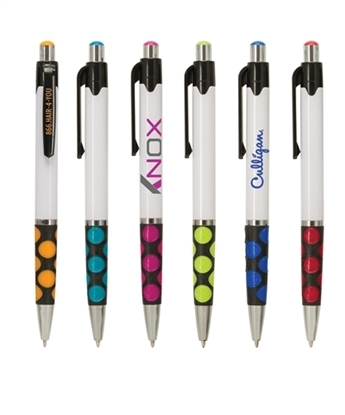 Simply, a pen for any occasion, this retractable pen offers a white barrel with colored rubber grip and matching trim. Imprint any color you chose or have the imprint match the trim. 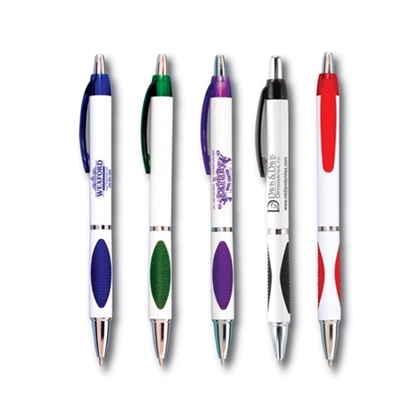 This classic twist action promotional pen with silver accents has been around for decades. Rich look and feel with newer lower prices. Contoured transparent barrel. Smooth colored rubber grip. Retractable mechanism. Medium point black refill. Factory suggests black or white printing on the translucent barrels for optimum visibility. 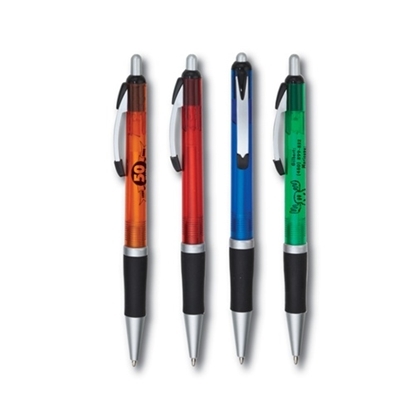 Translucent frosted barrel with colorful grip and accents make this pen a hit for sure. This retractable pen that has a very cool retro comfy grip. 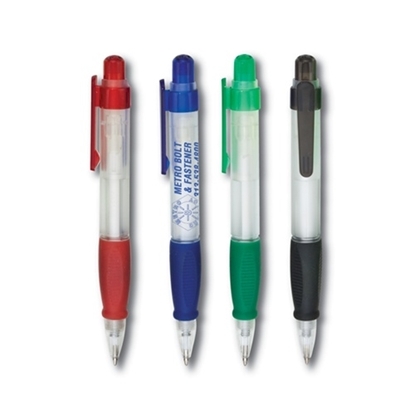 The Madeline pen has a color top to the plunger, clip and a white barrel..
Mypromotionalpens.com offers the largest and best priced selection in Promotional 100 Minimum Quantity. We will price compete and we won't be under sold. Let our graphic designers make your personalized 100 Minimum Quantity standout above the crowd at no charge. We won't stop until you are completely satisfied with your custom 100 Minimum Quantity art proof.Use category search filters on your left to help narrow your search to find exactly what you are looking for.